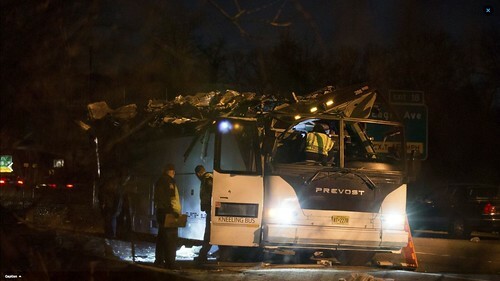 Here's the news story about a bus striking a low clearance bridge on the Southern State Parkway on Long Island. "Major David Candelaria of the New York State Police...estimated the height of the clearance to be less than 10 feet." The article says it was an 8-foot clearance, but the signs say 7' 7". I'm really surprised the state police are so far off estimating the bridge height. The parkways in NY state were intended for passenger vehicles only, so designers intentionally made the bridge clearances low in order to discourage any future legislature from opening up the parkways to trucks and buses. Here's an interesting article that discusses the motivations of Robert Moses, who designed this particular parkway, to make these bridge clearances even lower than they are on other New York parkways. The primary accusation made against Moses was that he was rabidly racist (apparently a proven fact) and he didn't want low-income people (who he assumed would be mostly black or Puerto Rican) to come by the busload to the parks and beaches that are connected by the parkways. The author identifies one beach that was obviously designed for bus access, so he thinks the racism story may not be true. The comments are very interesting. The ones from locals are like "Driver's fault, everyone knows about NY parkways," "Driver's fault, everyone in the northeast knows about NY parkways," or "Driver's fault, there were warning signs." I've been on NY parkways just a few times (when I lived in the northeast), and while I greatly appreciated their aesthetics, I wasn't consciously aware of the bridge heights, so I think there's just a lot of New Yorkers who think everyone knows all about New York. 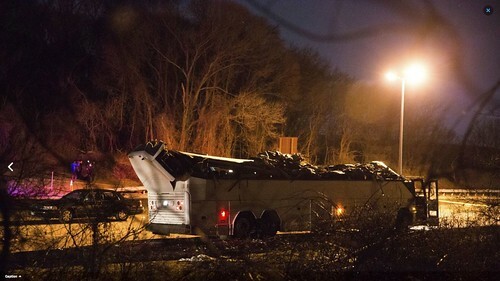 The article says the bus passengers were returning home from Europe. I assume, therefore, that they were coming from one of the NYC area airports and heading east (the accident site is east of any airports). In fact, it seems most likely they were coming from JFK airport because from JFK you can get on the Belt Parkway from either I-678 or the JFK Expressway. The Belt Parkway then takes you to the Southern State Parkway. I used Google Streetview to search for warning signs and the photo below shows the first (and only) warning sign that the parkway is for passenger cars only. This is coming from I-678. I could find no similar sign for those coming from the JFK Expressway. First (and apparently only) warning signs entering Belt Parkway from I-678 leaving JFK Airport. I used the New York State database of bridge heights that the Post author referenced. You've got to zoom in a lot before it becomes useful. I would expect a state department of transportation database of bridge heights to have both the highest and lowest clearance heights from both directions, a total of four heights. But the NYDOT only lists one height (the lowest) for each bridge. They only distinguish the different heights for either direction if the bridge has two arches. One arch bridges get only one height. IOW, inadequate. Searching for info on the typical height of intercity buses, I found that the limit is 12 feet, but I didn't find any particular bus models taller than 133 inches (11' 1'). The extra 11 inches is probably a safety margin to allow for heavy snow on the road surface or changes in the height of the road due to repaving. I found a couple of trucker forums where drivers claimed that posted clearances in New York State are 12 inches lower than the real clearance. If those claims are true, then an 11' 1" bus ought to fit under any New York bridge with a labeled clearance of 10' 2", giving a tight one-inch safety margin. 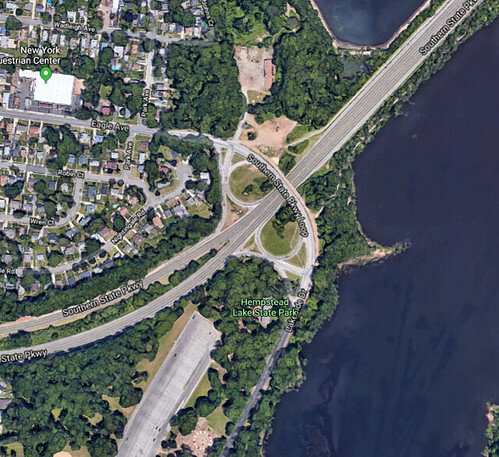 Using that state database and following the route of the bus, the first bridge that appears too low for them is where the Belt Parkway passes under 130th Avenue. The photo below shows that underpass. NB Belt Parkway under 130th Avenue. The 9' 8" warning sign is the lowest clearance in the right or left lane. If the bus had been in the center lane at this point, the clearance there might have been a nominal 10' 2" or more (11' 2" in reality, if we trust the alleged 12-inch safety margin) and the bus would have cleared it with an inch to spare. As the bus transitioned from the Belt Parkway to the Southern State Parkway, it would go under the nominally 8' 6" bridge shown below. 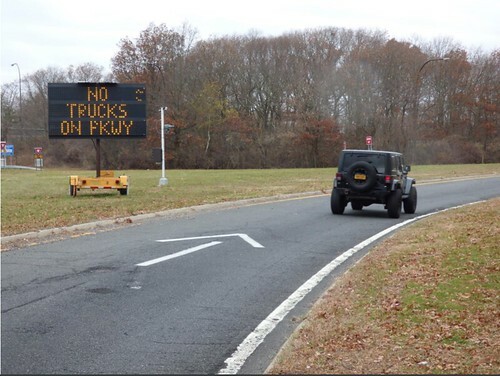 First warning sign on EB Southern State Parkway coming from Belt Parkway. If 8' 6" means 9' 6", the clearance over the leftmost lane would need to be at least 17 inches higher than that over the right lane. It's possible. BTW, the only height clearance warning signs I could find on the parkways were the single signs mounted on each bridge, small and usually white, although some were yellow as shown in the photo above. On entrance ramps I could usually find one standard "No Trucks" sign and two diamond signs showing the clearance of the first bridge to be encountered. The sign on I-678 is the biggest, flashiest warning I could find and even that one says nothing about low clearances. There were no "No Trucks" signs on the parkways, other than a single one at each entrance ramp. There were no "Trucks/Buses Must Exit" signs at any exit. The next underpass has a nominal clearance of 8' 11", but that sign (white) is obscured by vegetation, as you can see below. EB Southern State Parkway under Elmont Road. An additional 15 inches of clearance would be needed for an 11' 1" bus (again, assuming the NYDOT actually deducts a 12-inch safety margin from their signs). There might be 15 inches difference between the righthand edge of the road and lanes number 2 or 3 (counting from left to right). Then we come to Fletcher Avenue where the nominal clearance is 7' 8" which is only one inch higher than the underpass at Eagle Road where the bus accident happened. EB Southern State Parkway at Fletcher Avenue. Google Streetview sometimes pixelates the height signs because they appear to be similar to license plates, which Streetview routinely pixelates, but the NYDOT database says this one is 7' 8", and that does not appear to be inconsistent with the pixelated sign. There would need to be a whopping 28 inches of additional clearance in lanes 1 or 2 (left to right) for the bus to pass under it, but pass under it the bus did. Continuing east, the next bridge at Corona Avenue is nominally 9' 3". The next very low clearance bridge is at Franklin Avenue where the nominal clearance is 8' 7". After that the bus passed through four underpasses that seemed to have a nominal height sufficient for the bus to clear. And then they came to Eagle Avenue which is nominally only 7' 7", shown below. Eagle Avenue bridge across Southern State Parkway, eastbound..
Click to go to the Google aerial view of the interchange of Eagle Avenue and Southern State Parkway. 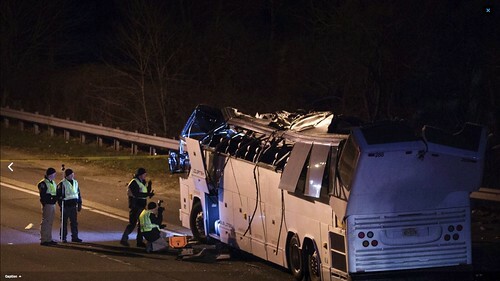 The photos of the wrecked bus in the Post article show much greater damage on its right side than on its left, so I think it was in the right lane and hit it at 7' 7" (or 8' 7" in reality) which would be about 23 inches lower than the top of the bus. The bus driver is a professional, so he should have noted the one warning sign he went under when going from I-678 to the Belt Parkway (if indeed that was his route). And he should have known that buses were prohibited from parkways. The bus company is based in New Jersey, so I think it's save to assume they do a lot of driving in New York State. In addition, the driver should have noticed his hairbreadth clearance under some of the bridges before he got to Eagle Avenue. If he'd been paying attention, that alone should have caused him to question the wisdom of his route. The signage, however, erected by the NYDOT is all consistent with the assumption that every driver knows you can't take a bus (or truck) onto a parkway, and every driver knows there are very low clearance bridges. But that's a bit like the reasoning "but I had the right of way" as you lie dying on the pavement somewhere. Three vehicles a year strike this bridge! How many hit the other very low clearance bridges on this parkway? Construction of the Southern State Parkway began in 1926. It's been 92 years and no one has ever felt the need to upgrade the signage?! "In December , Gov. Andrew M. Cuomo announced a $4.3 million project to install an electronic warning system that detects when oversize vehicles enter parkways." Here's what the NYDOT claims in that article: "An over-height vehicle entering would break the beam, triggering a warning message on a full color LED variable message sign display. The warning would indicate that the vehicle is over height and alerts the driver of impending bridge strikes ahead," but if you look at the photos you'll see the sign falls far short of what they claim. Full color LED? I don't think so. This is old technology, certainly not any color but amber. I don't think these lights are LED or I wouldn't see so many burned out elements both out on the road and in this photo. If they are truly LED, they could do a lot more with them than simply display crude dots. As for "The warning would indicate that the vehicle is over height and alerts the driver of impending bridge strikes ahead," uh, I don't think so. If the sign in the photo actually does that, it's going to have to scroll three or four message displays to do so, and the offending vehicle will have passed by the sign already. In addition, the sign is placed too late. Is the driver of the truck or bus supposed to back up or do a u-turn across the grass or just stop and call the highway patrol to assist? In the photo it appears that the detector is actually placed AFTER the warning sign, so its only real function would be to alert following drivers to get their cellphones ready to record the expected crash. The NYDOT seems to work on the assumption there are no stupid or ignorant drivers on their roads. Most other states have learned the folly of that assumption when dealing with potentially life-endangering road hazards. In California there are generous warning signs where stupid or ignorant drivers might do the wrong thing. The bus driver is technically at fault in this case, but the NYDOT is doing less than the minimum to try to mitigate the risks of these low clearance parkway overpasses. The very least they could do is use the standard big yellow signs that are mounted on bridges directly over the roadway...and clear the damned vegetation! There are at least a couple of low clearance bridges elsewhere in the United States that are routinely struck by high clearance vehicles. Go here to read and view videos about the infamous 11' 8" bridge in Durham, North Carolina. Note the extremely generous warning signs for the stupid or ignorant. Even so, plenty of drama still happens.